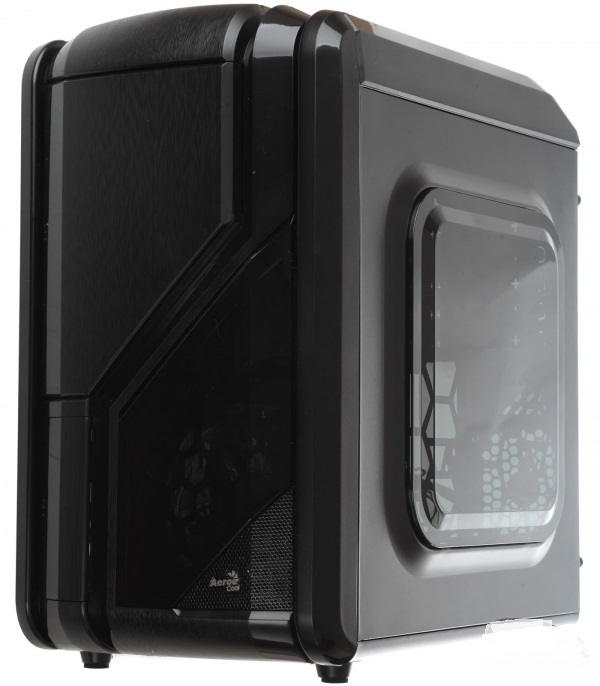 Aerocool GT-RS is interesting not so much because of its adorable design, but because of a very unusual interior, which to some extent can be called unique – it allows for small external dimensions to accommodate the motherboard of form factor ATX, full-sized power supply and a long graphics card, and then even more. 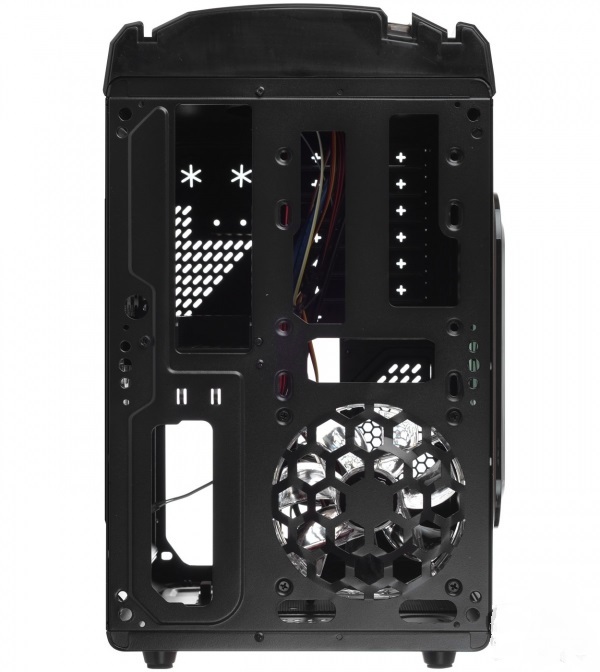 Among other things, the motherboard places in the case in not the standard way, but inverted for 180 degrees (such construct is often found in cases of Lian Li). 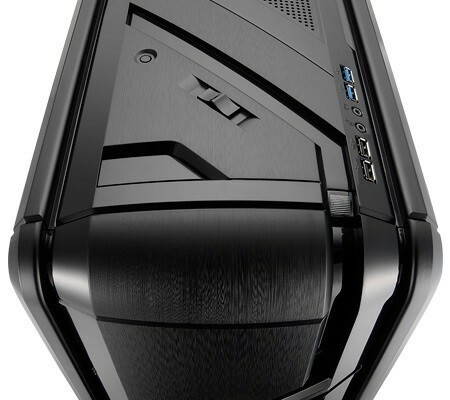 And another interesting solution – the ability to switch the backlight of the front fan from blue to red and back. Aerocool GT-RS got pretty design in a futuristic style. 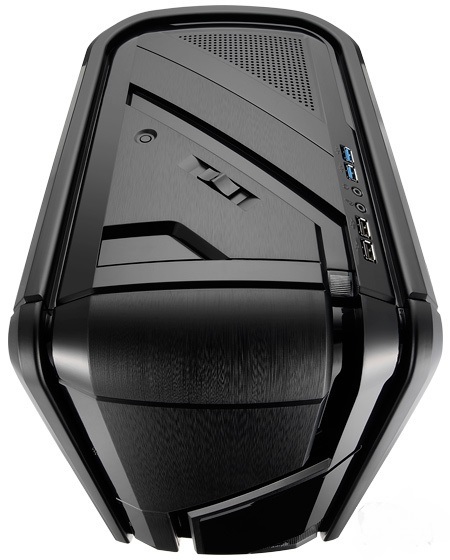 The case looks aesthetically pleasing due to its rounded edges and machined front panel. Dimensions of GT-RS are 236 mm in width, 353 mm in height and 320 mm in depth. Net weight – about 4 kg. The top panel is made of plastic and bears a lot of controls. So, on the right side there are two USB 3.0 ports (the connection to the internal connectors on the motherboard), two USB 2.0 ports, as well as two slots mini-jack 3,5 mm for headphones and microphone (only HDA). On the left side there is a large POWER button with a rather deep way and slightly higher – a tiny reset button. Indicators of the PC and hard disk activity are above the power button next to the ports. Of particular interest is a slider of built in controller of fans, which can be seen in the middle, between the USB ports and power/reset. It has five fixed positions and makes it possible to reduce the speed of rotation from the nominal full-fan ~ 1200 to ~ 500 rot/min. So why there are five positions and only two speeds? This is the feature of Aerocool GT-RS (we see it for the first time): the front fan is equipped with two-color LED that can light up a blue or red – positions are for them.